Location: 65 East Huron Street, Chicago, IL. St. James Episcopal Cathedral, Chicago. 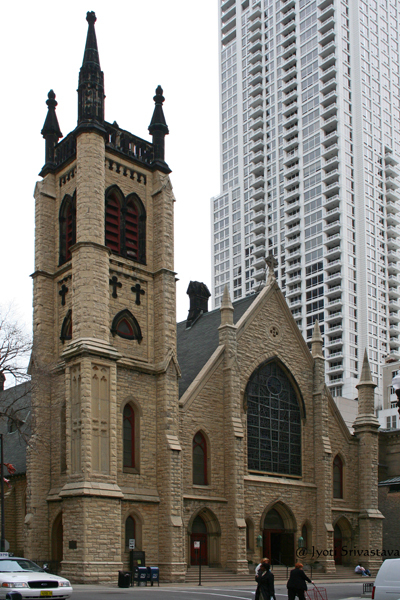 The Cathedral is the oldest Episcopal Church in Chicago. The parish was organized in 1834. Its exterior, Lemont (Joliet) limestone with Bedford, Indiana limestone trim, was originally built in 1856-7. The final completion and dedication of the church structure was in September, 1871. On 9 October, the second day of the Great Fire, the church was mostly destroyed. Portions of the exterior walls and the bell tower survived. It was rebuilt in 1875. The single, large tower to one side of three doorways is typical English neo-Gothic styling in the style of Pugin. 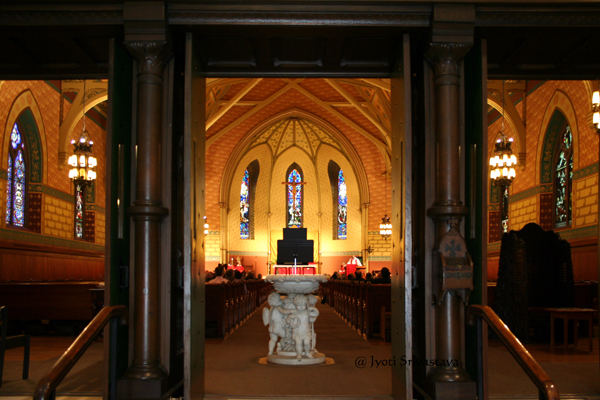 The entrance has three doorways that open into a large narthex. On the left (north) wall of the narthex is an altar erected “In honor of those who fought — in memory of these who fell,” in the Civil War. 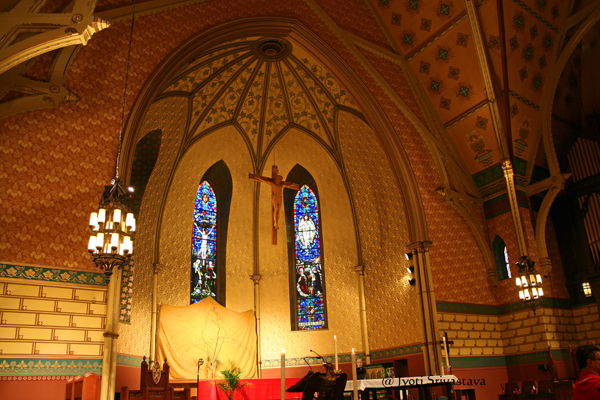 Designed by Frederick Law Olmstead of Vuax, Withers and Olmstead of New York, the altar survived the fire. Paul Popp Memorial Font / St. James Episcopal Cathedral, Chicago. In the central nave entrance way stands an important Carrara marble font, the Paul C. Popp Memorial. It was carved by Augusta Freeman, in 1874 and given to the Church in 1875. The carved wood and painted reredos, showing another Christ-in-Majesty was given in 1884 to honor a longtime rector, the Rt. Rev. Robert H. Clarkson. 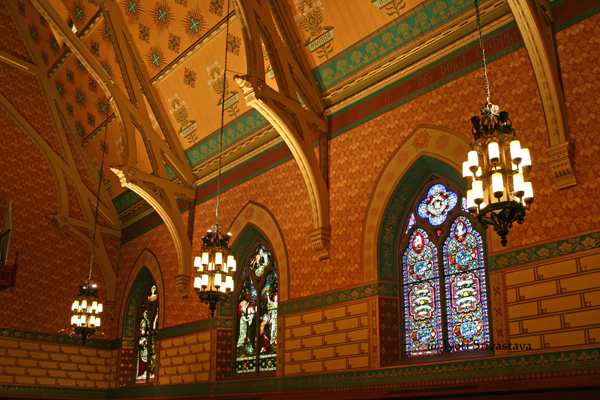 The hammer-beam truss vault as well as the walls bear the 1888-9 stencil décor of E.J. Neville Stent an English Episcopal inspired neo-Gothic Revival Arts and Crafts design living in New York. In 1985 the Holabird and Root with Walter Johnson undertook the restoration. Bob Furhof returned the walls and vault to their original splendor. 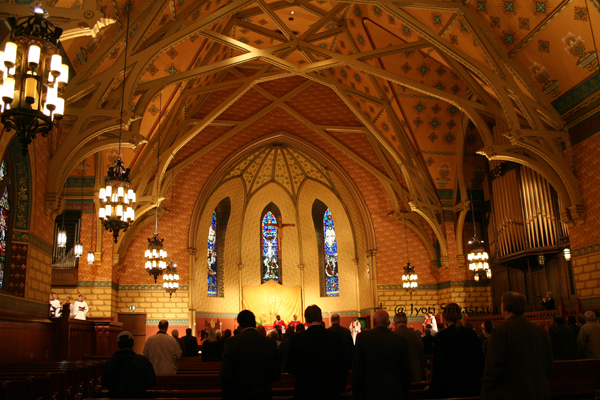 Throughout its history, St. James has offered an outstanding ministry of sacred music. The present organ was installed in 1920, and a new 4-manual console and the portion in the north transept were installed in 1968. The organ was rebuilt and enlarged in 1999. Today the entire instrument has 99 ranks. 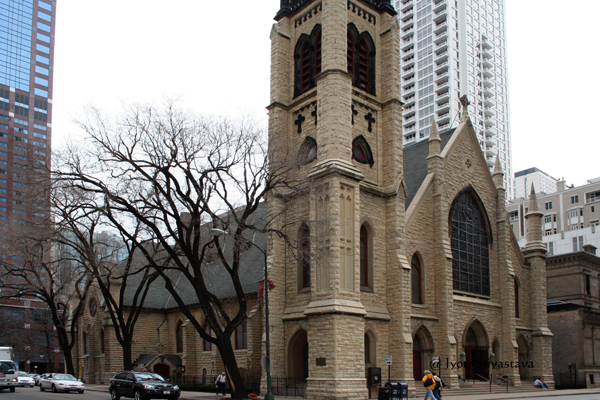 After Chicago’s first Episcopal cathedral, Saints Peter and Paul, was lost to a fire, St. James became the Cathedral of the Diocese of Chicago in 1955. The “cathedra” or bishop’s chair has the diocesan coat-of-arms on both the front and back. 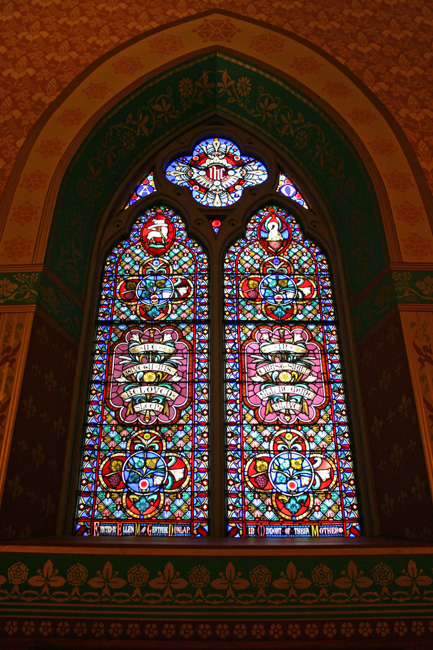 Most of the windows date from the end of the nineteenth century and are finely-painted glass. With Biblical subject matter and rich symbols, these Victorian period jewels were gifts of many Chicago leaders who were St. James members. 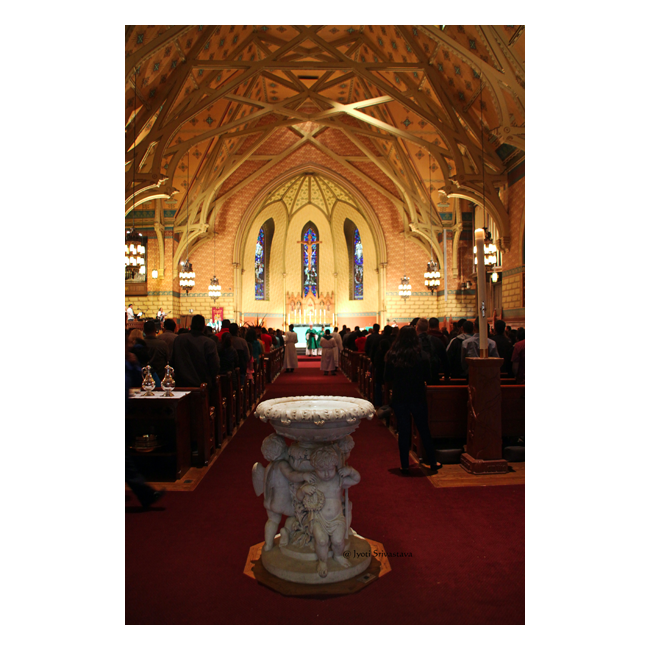 The choir loft rose window shows a Christ-in-Majesty surrounded by angel musicians. 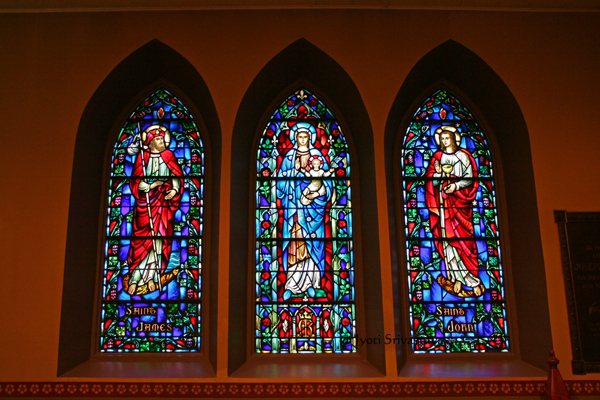 The choir’s English windows show Biblical events involving St. James, the Transfiguration, and the Garden of Gethsemane. 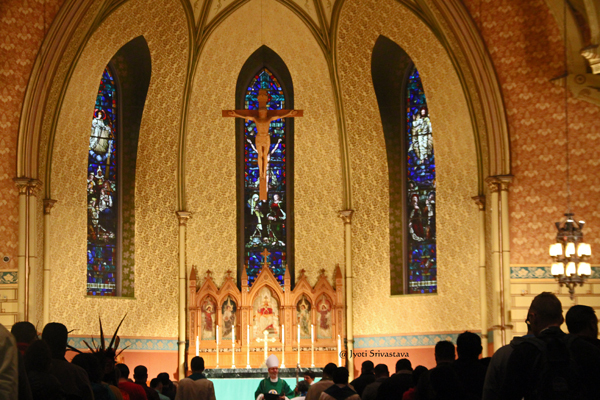 The altar windows, based on the Epiphany, Crucifixion, and Ascension were given in memory of the Rev. James DeKoven. They were lengthened in 1962 when the marble altar and floor were installed. The great Christ the King window (the Randall Memorial window), over the entrance is the work of Charles J. Connick of Boston, 1963. The window is a particularly powerful mismatch with the rest of the building. Outside, along the north side of the church is the Chapel of St. Andrew. 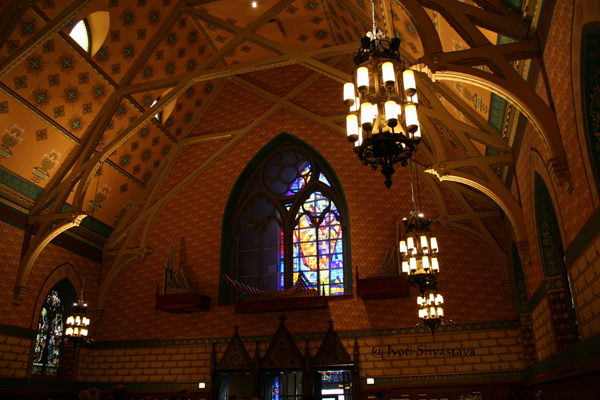 Designed by Bertram G. Goodhue, it is replicated after a late gothic priory chapel in Southern Scotland. The chapel opened in 1913 as a memorial to James L. Houghteling and his Bible class that founded the Brotherhood of Saint Andrew in 1893. 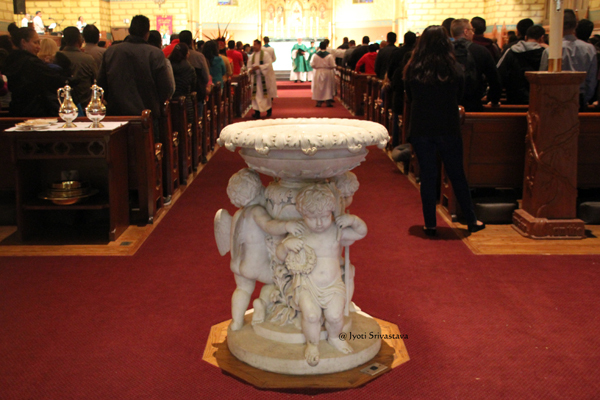 The altar area is particular importance. The altar painting is by Phoebe Anna Traquair (1852-1936). The floor tiles are set in lead? and may be medieval or manufactured after Pugin or Morris designs. The stained glass roundels are very fine examples of Dutch-Renaissance Revival from the 1880s or are of a later revival of medieval painted glass from the 1920s, as at Cranbrook. A silver ewer and paten designed by Ralph Adam Cram are preserved in the Cathedral treasury.